Rotherham Harriers win 4 team golds! The 2016 championships were held on a new course around Thornes Park. The event has not had a regular venue following the loss of the Don Valley Stadium in 2013, and it is hoped that this venue can be regularly used for an annual road relay championship. Yorkshire County are grateful to both Wakefield MBC and to the Sports centre management for their help in getting this inaugural event to happen. The weather on the day was excellent - warm & sunny, but this did make the park paths very busy. Thankfully all the athletes safely navigated their way around the 2580m lap. The races are for 4 age categories - Under 13, Under 15, Under 17 & Junior / Senior, for male and female runners. All ages did one lap except senior men who did two. The under 13 and under 15 races are straight races, with he first 3 club athletes position total counting as the team points for their club. Lucy Elliott, in her first race for the club, made a great debut to finish 9th and Abby Stroughair had one of her best runs to date to finish 10th - importantly they were ahead of the 2nd and 3rd Wakefield runners, beating the Wakefield team score by just 1 point. Rotherham 23pts, Wakefield 24pts,City of York 27pts. Beth Mount (20th 10:23), Erin Lonsdale (27th 10:52) Keira Sampson (28th 10:59), Keiva Rennocks ( 29th 11:04). In the U15 boys we had 4 athletes, Bailey Stead was our first runner home in 11th place (8:37), Howard Kniveton 17th (9:06), Jack Steele 25th (9:27)h & Will Beaton (in his first race for the club) 28th ( 9:35). The team were 5th, one place in front of local rivals Hallamshire Harriers. The U17 women's team were 1st after leg 1, with Mya Taylor running the fastest time of the day with 9:15, Cyane Robinson retained the lead with a time of 9:45 (2nd fastest) and Ellis Jackson secured the gold with a time of 10:22 (5th fastest) to bring the team home 2 mins and 7 seconds in front of Holmfirth harriers. We only had two athletes in the U17 men's relay and did not therefore have a complete team due to an athlete being injured and unable to run. Jack Stokes was 14th fastest with a time of 8:42 and Aaron Wickson 22nd fastest in 10:14. City of Sheffield & Dearne AC won the team event. In the senior women's race we had two teams, and had high hopes of a strong performance from the A team; boosted by the inclusion of two new athletes who have joined the club this summer:- Zara Knappy and Natalie Griffiths..
Natasha Hatswell ran the opening leg for the A team coming in just 4 seconds behind England International Katie Walshaw, who ran the days fastest time of 8:47, Zara took the club into first place on leg 2 with a time of 8:58; Hallamshire Harriers moved into 2nd place 24 seconds behind Zara. Natalie ran 9:02 to increase the lead over Holmfirth to 42 seconds. Samantha Johnson left the stadium with Nicola Squires in hot pursuit, Sam didn't weaken though and brought the team home 44 seconds ahead of Hallamshire, with the second fastest time of 8:50. Holmfirth finished in 3rd place. The club B team were led out by Emma Parkinson, who had a good run to finish 4th on leg 1 with the 9th fastest time of 9:08. Emma Dutton (10:42) Jess Freeman (10:10) and Mary Jenkinson (10:51) finished in a creditable 7th place. In the senior men's race, the increased strength of the Harrier's senior team meant that we fielded 3 full teams of four athletes. On the opening leg Kyle Craib was the first harrier home in 3rd place in 16:16 - the 3rd fastest time of the day. Kyle was in the C team, as he didn't have Yorkshire eligibility, living in North Notts. Gareth Sampson was next (A team 5th 16:37) and Arron Larkin was 7th for the B team (16:58). Wakefield's A team had a sizeable lead after leg 1, with James Saxton's fastest time of 15:55 - the only sub 16 minute time. After leg 2 Wakefield had still a lead of almost a minute, but Sam Clegg had moved the A team up two places to third, with a time of 16:49. Chris Adams (17:25) came in 4th for the C team, with Joe Massingham moving the B team up 2 places to 5th. On the critical 3rd leg Elliot Smales continued to gain time on Wakefield on the first lap with Holmfirth now leading. After the second lap Elliot came in just 17 seconds behind the leading team Holmfirth, to leave Aidan Johnson to hopefully clinch the victory. New member Jonny Johnson (17:05) brought the C team up to 3rd & Phil Hoole (17:33) kept the B team in 5th. It was all to play for on leg 4, and Aidan did not disappoint the club supporters, he took the lead on his first lap and extended the lead to finish 32 seconds in front of Holmfirth, with Wakefield taking 3rd place. Richard Harris (17:25) brought the B team home in 4th - after winning the bronze medal in the Yorkshire Veterans Cross country championships the day before! Team manager Nigel Brookes anchored the C team to 5th place with a time of 20:35. It is an indication of how strong the club now is at senior level with 5 of the women's team being in the top 10 fastest times, and 8 of the mens team's in the top 20 mens fastest times. 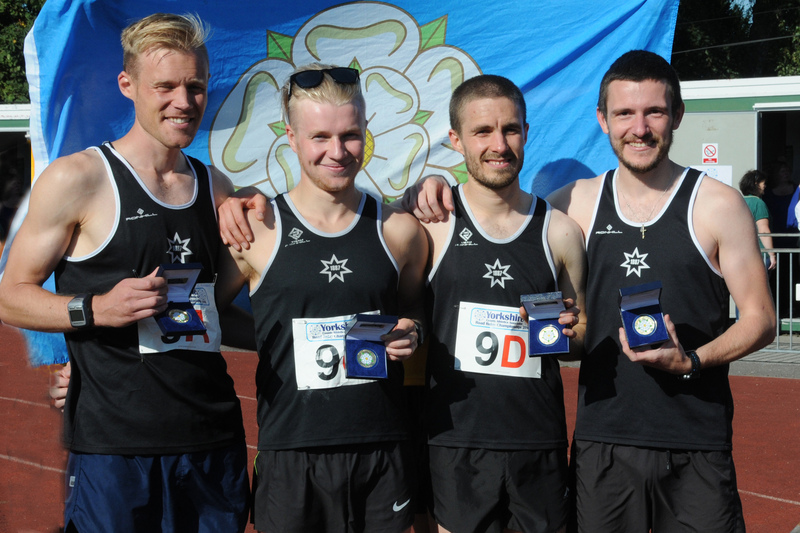 This is the first time the club has won both senior titles, and gives the club a confidence boost for this coming weeks Northern relay Championships at Manchester where the teams are of 6 athletes in the men's race.